As the entire world knows, 129 innocent people were cruelly murdered last Friday in Paris, France by savages related to ISIS (the Islamic State). Another 350 people were injured, many of them seriously. It was the worst terrorist attack on the Western World since 9-11. In past columns I have called the Islamic jihadists the New Nazis because they share the same disregard for human life and rights as the followers of Adolph Hitler. There is also a major surge of refugees fleeing the barbarians. What must we do about the these new Nazis and new wave of refugees? Let’s begin with ISIS then look at the growing refugee problem. I use the word “must” for defeating ISIS because it is imperative that we act. “Should,” “might,” or “hope” does not suffice. ISIS is the cruelest global enemy the world has seen in a generation who are starting, according to Pope Francis and others, a World War III against freedom. We must defeat them. That’s the role of nation/states. Two days later, French bombers destroyed a major ISIS command headquarters in Raqqa, Syria–something President Obama’s “pin-pricks” failed to do in 8,000 sorties flown over Iraq and Syria. It appears that both the UK and France comprehend that courage and force are the only message that our enemies understand. Unfortunately, our US president doesn’t. He badly stumbled through a G-20 press conference in Turkey on the weekend sticking to the script that the plan is working, we are not fighting radical Islam, and that ISIS is contained. His fellow Democrat presidential wannabes played the same verbal patty-cake at their recent debate with Hillary Clinton stating the absurdity that “we are not at war with radical Islam” and Bernie Sanders droning that our biggest problem is climate change. I think one of our biggest problems is delusional US leadership. President Obama must either rise to the challenge of leading the world against the New Nazis or he should resign from office. Leading from behind or trying to run out of the clock on his second term puts multitudes of people in jeopardy. The threats are too great. Another “Paris” could take place at any moment in Berlin, London, New York, Washington, D.C., and numerous other cities unless ISIS is destroyed and the cut-off head of the serpent stops the twitching tail in other places. A vanquished ISIS would greatly reduce the possibility of coordinated and sophisticated terrorists attacks–at least until the next evil tyranny arises. Mr. President: Lead clearly and courageously or get out of the way. Donald Trump wants to bomb the Iraq oil fields to stop the flow of money to the killers. Ben Carson is willing to send in ground troops to squelch the jihad. Chris Christie says we must come up with a global plan to defeat the terrorists. And every other Republican candidate, with the possible exception of Rand Paul, agrees with President Hollande and Prime Minister Cameron. One commentator has proposed that NATO and its 28 member nations declare war on ISIS, led by the United States, and form a real coalition that sends air and manpower into Iraq and Iraq to destroy the ISIS stronghold and decimate their army. War is ugly and costly. But millions more will suffer if it’s not attempted and victorious. Some military analysts believe that 15,000 US ground troops supporting the Kurds (100,000 soldiers and the Iraqis–100,000 soldiers) –could destroy ISIS in about two weeks. We did so against an infinitely stronger enemy in the 1940s. We did it again in the Gulf War of the 90s. We must pray that President Obama will change his mind about the threat of Islamic terrorism, or pray for God’s protection until we can elect a courageous new leader next year. Choose wisely, my fellow Americans, next November 8, 2016. Now to the refugees which are also caught up in the destruction. The Bible is clear about God’s concerns for the poor, vulnerable, suffering, and displaced (Exodus 23:6, Deuteronomy 10:18, Psalm 9:9, and Isaiah 1:17). 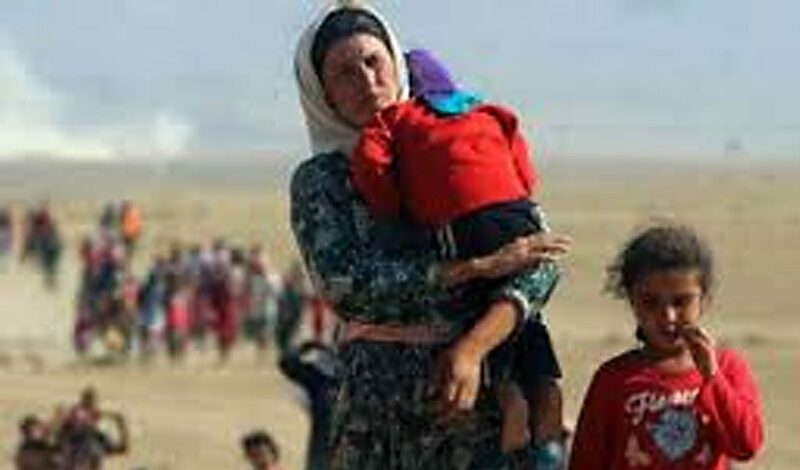 Right now there are hundreds of thousands of refugees that are fleeing Iraq, Syria, and some North African nations due to ISIS, Bashar al-Assad murderous regime, and other calamities. President Obama is right that it is “un-American” and goes “against our values” to be unconcerned about them. We should “do unto others as we would want them to do to us” if we are in touch with the God who deeply cares about individual people. If you and your loved ones were fleeing Syria right now, leaving everything dear behind, would you want someone to take you in and offer hope? We followers of Christ must offer that hope. But we can do it wisely–what’s best for them, for our own nations, and for the world as a whole. President Obama has committed to bringing 10,000 Syrian refugees to this country and many more long term. Many governors are saying no after it was learned that at least one the Paris murderers snuck into France under refuge status. How many other terrorists boarded that train to spread their havoc to Europe and beyond? Thus far, states whose governors oppose more Syrian refugees include Alabama, Arizona, Arkansas, Florida, Georgia, Idaho, Illinois, Indiana, Iowa, Kansas, Louisiana, Maine, Massachusetts, Michigan, Mississippi, Nebraska, New Hampshire, New Jersey, New Mexico, North Carolina, Ohio, Oklahoma, South Carolina, Tennessee, Texas, and Wisconsin. Kentucky Gov.-elect Matt Bevin, who will take office Dec. 8, also said he opposes resettlement efforts. A few political leaders like presidential candidate Ted Cruz have suggested that we admit only Syrian Christians, not Muslims because only radical Muslims are terrorizing the world and it would be hard to screen them out from the deserving refugees. 1. Settle the displaced refugees nearer their homeland, either in safe zones created by NATO or elsewhere in the Middle East where culture, geography, weather, customs, and values are similar to theirs. A number of nearby-Sunni majority nations fit that bill including Saudi Arabia, Turkey, Jordan, Qatar, and others. Nations with meaningful Christian communities such as Egypt and Lebanon could be opened to Syrian Christians. This would leave them close to their ancestral homes–and free to return–when-and-if Bashar al Assad is driven from power. 2. European and American governments should help financially with this re-settling in the Middle East. We have the resources to stand with other nations to help provide new lives for the persecuted and distressed. If these nations can open their doors, then we should help them make a new start. 3. Christian NGO’s, humanitarian and mission organizations should mobilize in the resettlement countries to alleviate the suffering and help the refuges prosper. This is the role of the Church–to bring hope, encouragement, salvation, and sustenance to those who are in need. 4. EU nations must re-think the Muslim “no-go” areas in some of their major cities, abolishing this version of reverse apartheid, and require all citizens to assimilate into their new country. Otherwise, would-be terrorists can continue to hide. Sharia law and any other form of coercion cannot exist in free nations. If you can’t assimilate, then emigrate to a nation whose laws you respect. 5. Out-law sanctuary cities in the United States. They are also hiding place for criminals and possibly terrorists. Hate evil and destroy it–a governmental task–and love good and serve the the displaced–which is the domain of God’s people. Lastly, let’s elect good leaders who understand the importance of both.